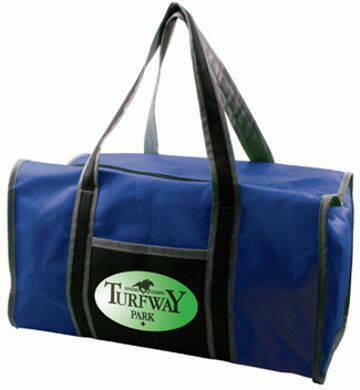 Wholesale Custom Non-Woven Duffel Bags Personalized. Recycled, Promotional, Inexpensive. Budget Prices for USA, Canada. Bulk custom imprinted economy recycled duffel bags, personalized in 1 or more colors, up to full color (see the Price Table below). We also supply wholesale blank (not imprinted) recycled duffel bags for $3.15 each. Budget Prices in USA and Canada for wholesale recycled duffel bags. American clients pay no taxes. Eco-friendly reusable non woven duffle bag made from recycled material. Features a large sized main compartment with zippered closure and a reinforced bottom for additional support. Also includes an outer pocket and 24" carrying straps. The unit prices below include your 1-color custom imprint on one side, or full color imprint (unlimited number of imprint colors) on one side. You may order any quantity above the minimum. We also supply wholesale blank (not imprinted) recycled duffel bags for $3.15 each. Blank duffel bags ship next day. Material: recycled nonwoven polypropylene, 90 GSM.